It was a small group (Total 5 people). The tour guide Nick was very friendly and knowledgeable about the regions. 3 wineries which is running by family, Golden Gate Bridges and Sausalito.Had a great time! This was my daughter and my first time to San Francisco, so we had no idea how to book a good wine tour. Our guide, Marc, was wonderful! He made us all feel so at ease, had so much information to share with the group, and made it an all-around great day. It was the best day of our trip. I absolutely recommend this tour! Went to three wineries - somewhat smaller in scale - but the knowledge and expertise the owners shared was extremely valuable. Our guide, Marc, was equally impressive in his knowledge and experience in wine country. I would do this tour again next year. Thanks Mark for the awesome trip!! We had an excellent time. Mark was very informative about the history of the area and most importantly ... about wine!! He was very personable with a great sense of humor (with a bit sassiness LOL). The wineries we visited did not disappoint. If you are visiting SF this is a great trip to book. Would definitely book again on our next visit. We had an absolutely amazing time on our wine tour. Our tour guide and driver, Mark, was informative, accommodating, and just all around awesome! My wife and I were picked up right at our hotel in Union Square and dropped off at the same. The other individuals on the tour were great, fun loving, and easy to talk to. We visited three wineries in total, two of which were small boutique wineries we would never have know about or seen on our own. We were also able to have lunch in the Sonoma town square, which only added to the trip. I can't recommend this trip, and specifically our guide Mark, more!! 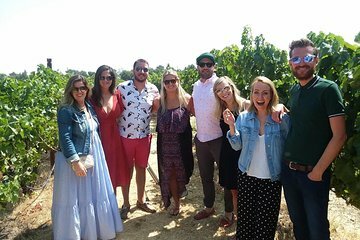 Growing up in San Francisco and living in the Bay Area my whole life, you would think I would know where to take my out-of-town friends when they want to go wine tasting. But I had no clue. Thankfully I found Marc at Edge of the World Tours and let him do the work for me! The tour was small and personal.Marcs stories of the local history were informative and funny, and I live in the Bay Area! The stops at the Golden Gate Bridge and in Sausalito added to our trip for a great mix of sightseeing and wine tasting. Im not much of a wine drinker myself, and I had never heard of the wineries we visited, but the staff at each winery was welcoming and helpful.Its a fun day overall and I now know like white wine! Looking forward to taking other out-of-town friends on this tour in the near future. This was the best tour I took while I was visiting San Francisco. The group size was small and Marc knew so much about the area and very funny also. I really like the choice of wineries 1 small, 1 medium sized, and 1 big winery which really gives you the full experience. It was a fun day. Great wine and great information at each winery.